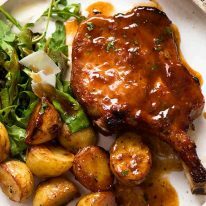 One of my favourite standby pork chop recipes! 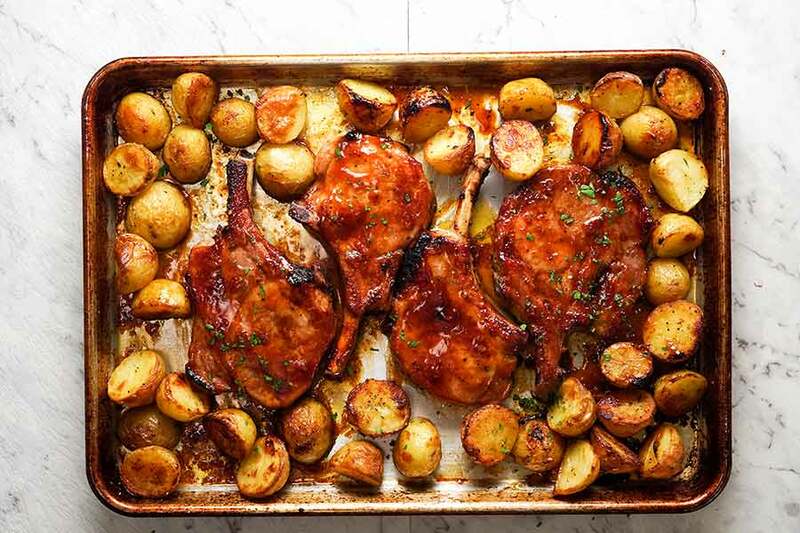 These Baked Pork Chops are a terrific way to cook pork chops in the oven. 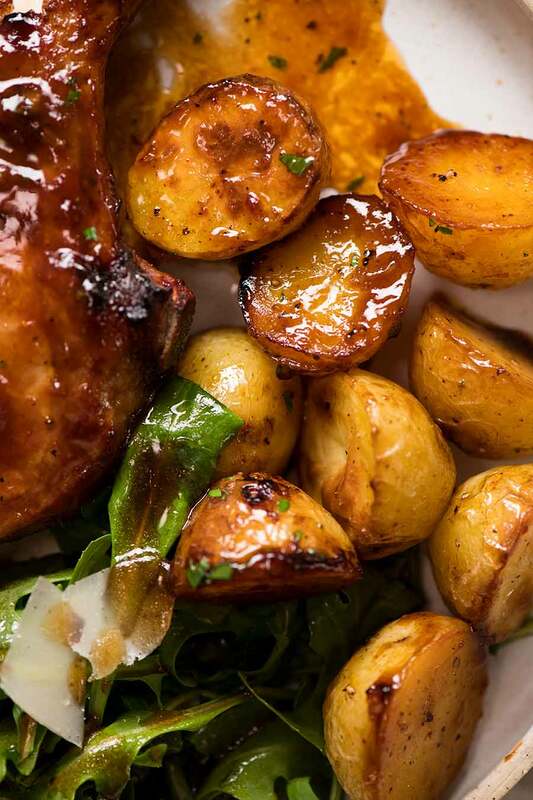 Slathered in a country-style sauce then baked until caramelised on the outside and juicy inside. So fast and easy to prepare, you can make this tonight! It’s savoury with a touch of sweet, balanced out with a bit of acidity. 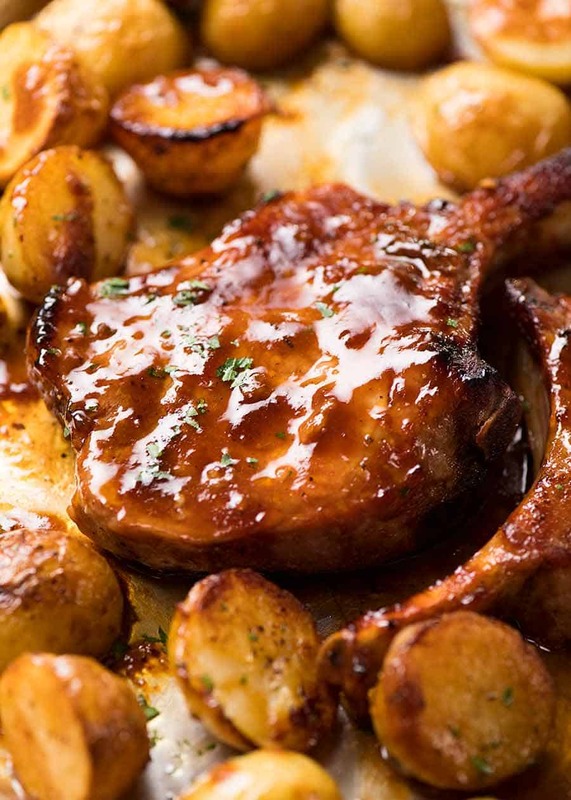 It makes your baked pork chops golden and sticky. And I kid you not – I bet you have all the ingredients in your pantry to make this right now! So here’s what you need for this magic pork chop glaze. These are all pantry staples in my world – and I’m hoping they are in yours too! finish with under the broiler/grill to get a really great caramelisation. Otherwise, the pork cops come out of the oven with no colour – and we all know that caramelisation = flavour! Flip, slather with remaining sauce then grill/broil for 5 to 10 minutes until cooked through and beautifully caramelised. There will be enough juices on the tray to baste with and to drizzle on the chops for serving. When the internal temperature of the pork chops is 145F / 63C. 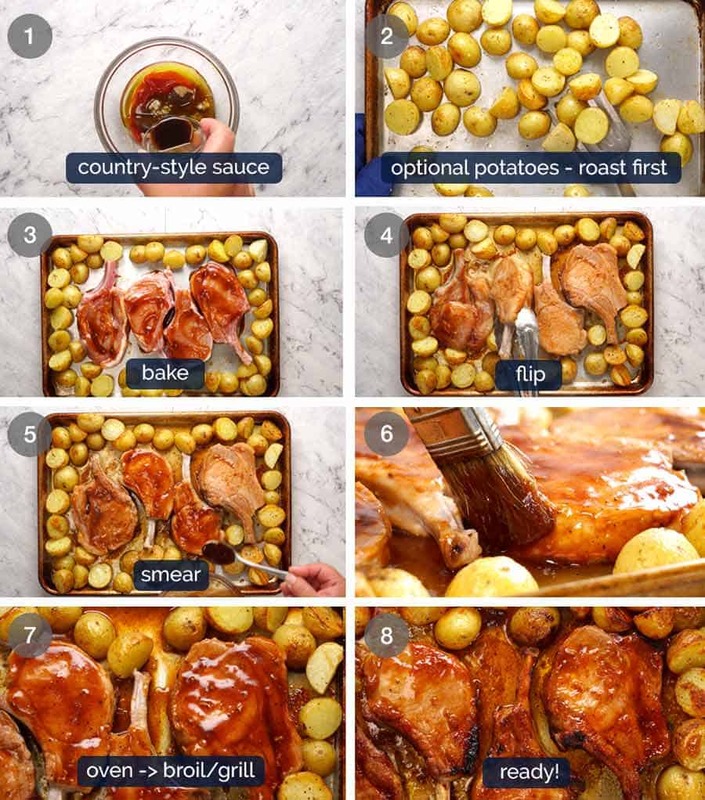 Optional – add potatoes! There’s room on the tray and I love the way the potatoes are crispy on top, and the underside absorbs the flavour and end up almost glazed! And they taste even better than they look! 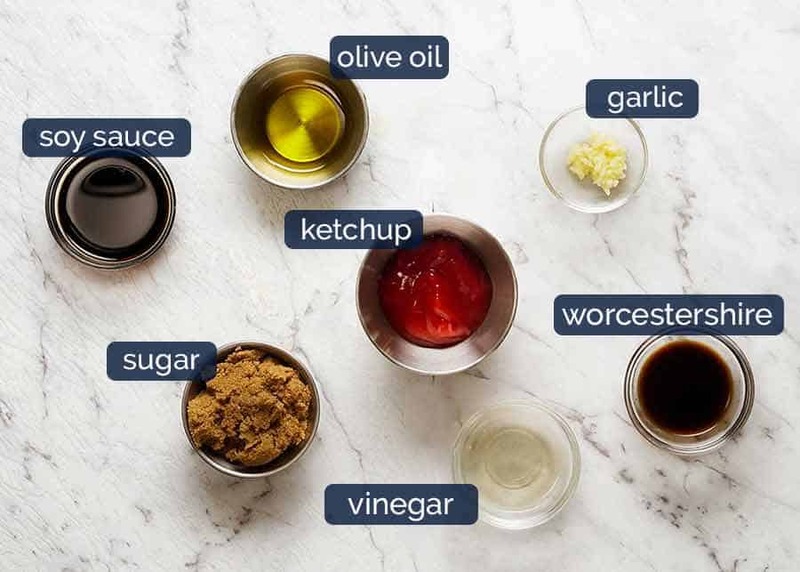 I use this same sauce for grilling and cooking chops on the stove but actually, my favourite way is baking. There aren’t many sauces / rubs you can put on baked pork chops where they come out looking and tasting this good. Normally they lack colour and therefore flavour. 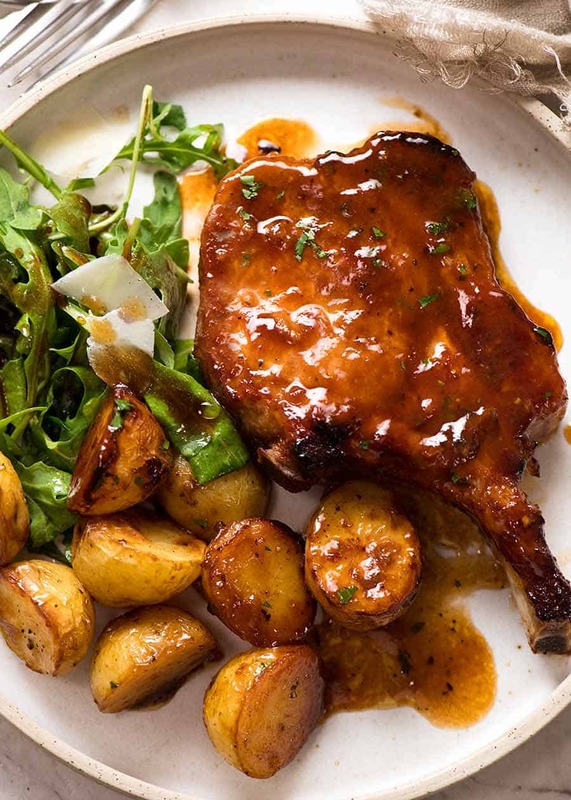 So this sauce (rub / glaze – whatever you want to call it) is made for baked pork chops. And don’t miss these classic we’ll love forever! Recipe video above. This is a sauce made for baked pork chops. It makes them come out golden and sticky, rather than pale and bland. It's a country-style sauce that's savoury and a bit sweet! Potatoes are optional - or sub with other roastable veg. Preheat oven to 220C / 430F (standard oven) or 200C / 390F (fan forced / convection). Take the tray out of the oven. Toss potatoes then push them to the edge. Place pork on tray. Bake for 15 minutes. Remove tray from oven, flick to broiler/grill on high (shelf about 20cm/8" from heat source). Flip pork, spoon over reserved rub and dab on sides. (Note 4). Broil 7 - 10 minutes until pretty well caramelised. Remove from oven. Use a brush to get the golden juices off the tray and dab it onto the pork - this is key for flavour and colour! Pop it back under the broiler for a couple of minutes to finish off. Recipe update: Originally published September 2016. Updated February 2019 to improve. Original recipe called for 10 minute baking x 2, followed by broil/grill to caramelise surface. Updated recipe calls for 15 minutes pork bake, then finished with just broiling/grilling. Better, more even caramelisation using this method! 1. Ketchup - Can also use Tomato Sauce condiment (American readers - don't use what you know as Tomato Sauce, use Ketchup!). 2. Soy sauce - I use normal soy sauce (Kikkoman). This can be substituted with 2 1/2 tsp light soy sauce. Do not use dark soy sauce - flavour is too strong. 3. Cider vinegar - Can be substituted with any clear or neutral flavoured vinegar. Don't use balsamic. 4. 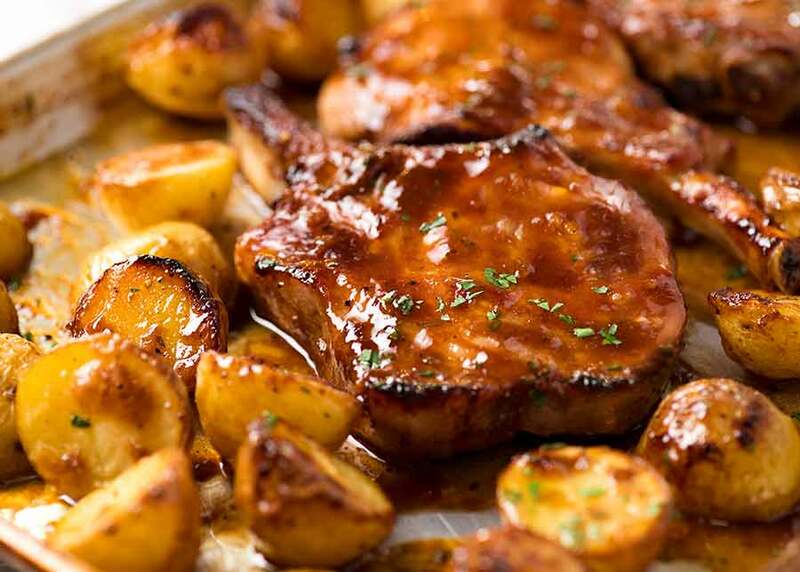 Pork - This can be made with any pork chops. Bone in is better because it's juicier. 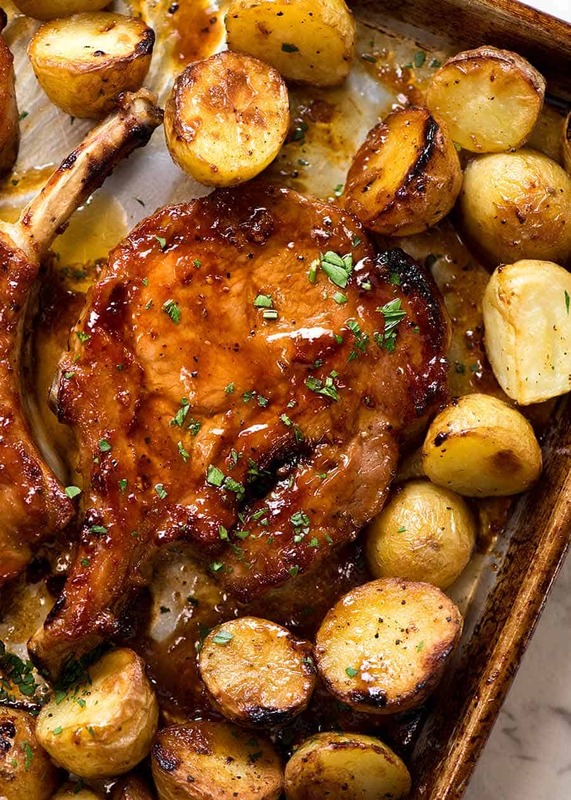 Cook time will differ depending on size of cutlets - my cook time is based on 200g/7oz pork chops with bone in. For 350g/12oz, bake pork for 15 minutes + 10 minute broil/grill + extra minute for post basting caraemsliation. Also see the chicken version. 5. Potatoes - Make sure the potatoes are no larger than 3cm / 1 1/4" diameter otherwise they won't cook in the prescribed time. You can either increase the initial bake time OR cut the larger ones which is what I did. 6. Marinating option - Optional, not required but can do. Place in a ziplock bag, add the pork and massage from the outside to coat the pork in the Rub. Refrigerate for up to 24 hours. If freezing, put the bag straight in the freezer, then defrost before using. It will marinate while defrosting. 7. 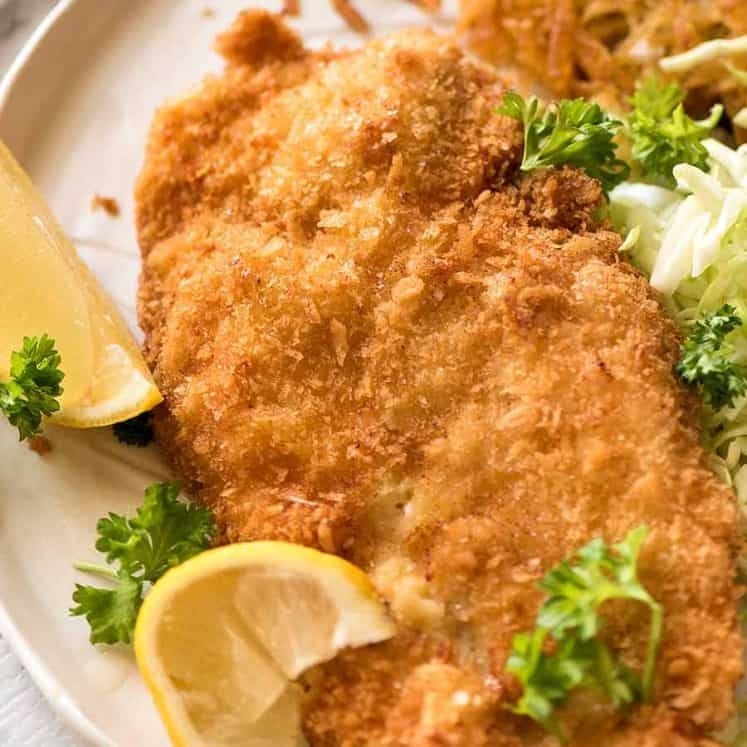 Nutrition per serving including potatoes, assuming this is made with trimmed pork cutlets as pictured. This is from the first time I shared this recipe. Normally I update with his latest happenings when I update a post, but I want to keep this! Will definitely be a regular on our dinner menu, so scrumptious! Made these chops tonight and served with good old irish champ with scallions. Absolutely delicious; Nagi – your recipes are the very best! Thank you!! Made these chops tonight and served with good old irish champ with scallions. Abdolutely delicious; Nagi – your recipes are the very best! Thank you!! I made this for tonight’s dinner. My daughter absolutely loves it. Thanks for the recipe. You’re so welcome! I’m so glad you loved it! Thank you for the details!! As a novice cooker some things are not as self explanatory as a expert cooker may think! can’t wait to try this one! I’ve cooked three of your recipes so far and my husband has raved about each one! Thank you for such delicious and simple recipes!! I hope you love it Cathy, let me know what you think! It was delicious! 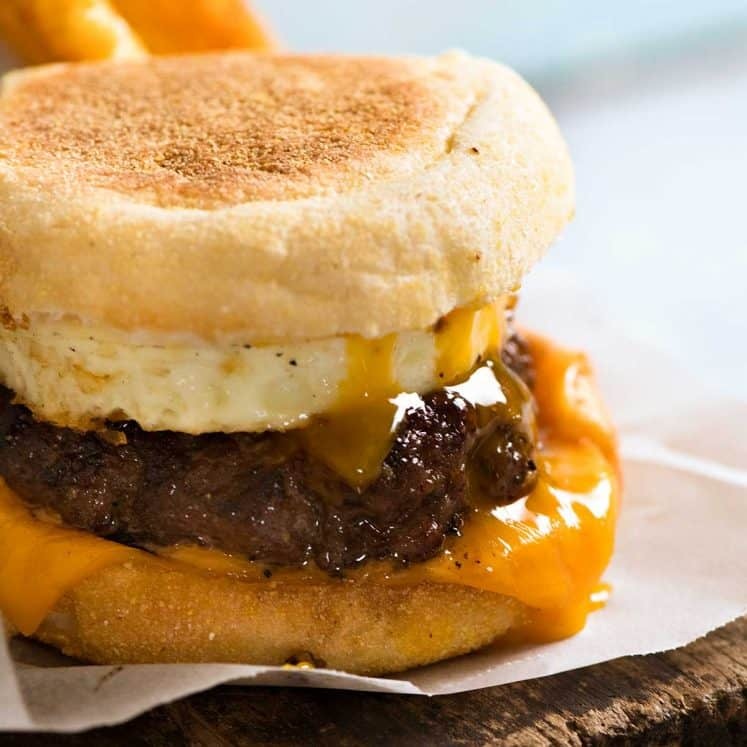 Loved the caramelization and again – quick and easy! Tonight I’m cooking the one-pot macaroni & cheese! Yum! I needed something for tonight’s dinner.